Cooper - I Believe In Love 12"
TRANCE, Product Recordings, UK, 2003... 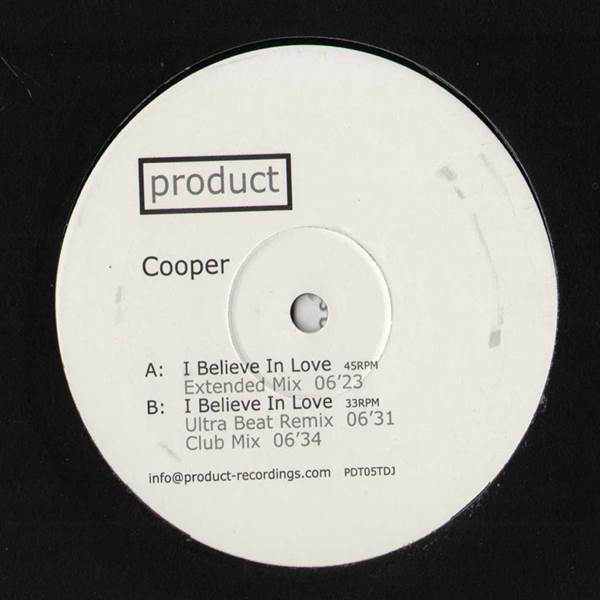 I Believe In Love (Extended Mix), I Believe In Love (Ultra Beat Remix), I Believe In Love (Club Mix). York - Reachers Of Civilisation (Disc 2 Only) 12" Moonchild - V.O.A.T (Variations On A Theme) (Disc 2 Only) 12" Beautiful Imbalance - Tinseltown (Boat Drinks Mix) 12" Baby Doc And The Dentist - Catalan Dawn / Catalan Rising 12"
Signal - Let Me In / Falling Away (Remix) / Down From Up 12" Jo Jo - Counting On Your Love 12" Signal - Falling / Dubplate Nation 12" Xavier Jacome - The Beginning 12"